I still haven't found time to experiment more with Neeo and the Neeo Homey app (Thanks @nklerk !!! ), but so far what I've done works well. I have seen that it is possible to "Show controls" of a device but I was unable to make a device "Balkon" with up and down buttons so far. But maybe I overlooked the option and maybe I just made the virtual device of the wrong type. That never happened to me. It uses both WiFi and 6LoPan, mostly WiFi. feel free to post on Planet NEEO and tag me in your post. After repairing and not reconfiguring too much, I haven't had the problem anymore. There are multiple way's you could do this and mostly comes down to the device type you are using. depending on the capabilities of the Somfy driver you could use a slider to set a specific value. but buttons are okay to. if a slider works then i would chose a device type ligt for instance. or Assesory. an Assesory device doesn't have a custom page in neeo but you can add all components like any other device as shortcuts. The device type and the button names are what the remote will use to map physical buttons and to add widgets. You could for instance add a gameconsole devicetype and set shutter up and down to the direction key's of channel up/down key's. there is an option to change the icon in the SDK but that isn't in my code yet. The device name is mentioned in the shortcut when adding it as a shortcut. Also Jorden, Know that you can also link your Onkyo driver with NEEO. When i completed this project: I will add the icon feature to my NEEO app. It might take some time before I'm finished with this driver as it's way more work then anticipated. Awesome... I totally love it when it all comes together I love how the 2 devices respond to each action! Thanks for the tips, I'm going to fiddle around with it this weekend! First a big compliment to Niels. Great job on this app. Just bought a neeo and I am utterly surprised how good it already workshop. I thought this would all be very buggy, but at this moment no bugs for me. This i also an accompshment of Niels as i was able to implement a neo coolcam wallplug in my Neeo. That way i can control al my light with Neeo. In the Neeo app i was not possible tot activiteit this Zwave plug. This app did the job. You could say that that truely is a bug of the Neeo app, as the app from Niels is a nice workaround. But I have a question. My english is not that well that i understand the compleet explanation from Niels inhis Neeo app. Tado is integrated in homey and it would be nice if i could control my thermostat with Neeo. How do i pull that off? Would be nice to get a short description with steps i do have to take. Another question is, I own a Harmony elite AB, Harmony supports grouping inside Sonos. As from this point Neeo does not support this, is there a way to implement this in Neeo. The app Harmony hub supports activities so you can make flows with these activities. Can i use this to use the Harmony activity “ Play Sonos” with a flow and a virtual device in Neeo. In that case i could make a Recipe play Sonos in which my Sonos Playbar, Sonos one and stereo Sonos 3 are grouped together. That way my Harmony AB would be totally unnescessary and in future time will be eating dust. The Harmony hub would probably the Hub that is needed for grouping Sonos. As for me buy a NEEo and you will be suprised, i bought is despite many bad reviews of the many bugs. Probably the Neeo team has worked hard on that. Thanks m8, I really appreciate your message! I have my thermostat controlled with my NEEO and works flawlessly and i'm confident i can help you achieve this as well. As I currently don't have much time i would like to ask you to share a picture showing what If... cards and ...Then cards the thado supports. I can then easily respond with flow suggestions. Install the simple log app. Make a New Flow and name it something like Log NEEO Events. In the if... column add the NEEO card and change it to NEEO Events. Drag the JSON tag from the NEEO, Event card to the text input of the simple log card. Go to homey settings and open the simple log app settings. you will be presented with live logging. Start your sonos recipe on the NEEO remote and note the activities coming in to the simple log. Marcelklim Als je dit in het nederlands wilt dan kan dat ook. 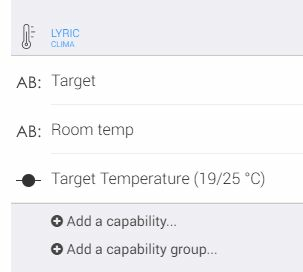 The way i do it is working well but doesn't look super clean as there is not a widget that i could use for a thermostat at this point. You need to add the capabilities as shortcuts. So your thermostat has more or less the same capabilities as mine has. 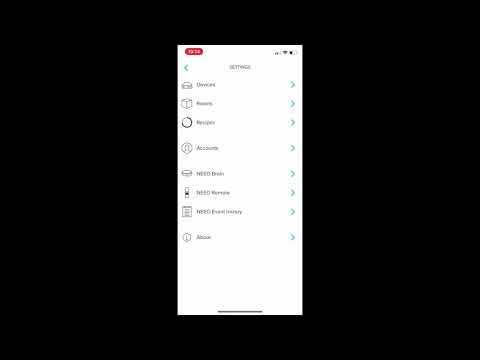 You can create a new virtual device using the NEEO settings. slider, Target temp or whatever fits (i have chosen a value between 19 and 25), that worked best for me. The first neeo card updates the value of the textfield. so it displayed the target temperature. the second neeo card informs the slided on what the current value is. so if you change the temperature directly on your thermostat then you will see the slider move to the position representing the correct temperature. So if the temperature is different then the textlabel gets changed to the actual measured temperature. Ignore the logging, you wont need it but i personally like to log activities. The first neeo card is to update the textlabel so you can see what you have specifically set with the slider. the second card sends the requested temperature to your thermostat. Use the value TAG. The decimal Tag is a percentage between 0 and 1 and is not usefull here. I will try this next week. I am sure i can work that out. Simply log installed and indeed gives me information. Have to figure that one out. For now I am going to install my Neo minix x 8-h plus. Fully updated. Hopefully this time Kodi will work better as before. Did not use it forca year. Neeo should be able to work in a better way as my harmony did before. For now many thanks. Will let you know when it is working. I did not find a Clima device name. Is this missing? Ah yes, sorry the climate device isn’t officially supported and I hacked it in. I’m about to update my 0.50.x release and I added the clima as an option so soon you’ll be able to. If you can’t wait then choose any other device type and later go to homey, settings, neeo, configuration. Mage a backup first by using the download button. Edit the configuration and change the device type to CLIMA. there are some other useful features in the coming version. Like setting the minimum value of a slider. Especially handy with a temperature slider so you can limit it to normal values like 19/23. in a couple of minutes I will push the code. It will then be available depending on how fast atom will approve the update. - Added slider minimum value. - Added function while adding a new txtlabel, checkbox to hide/show label name. - Added new device type "CLIMA"
- Added feature to select a custom icon while adding a new device. ## Version 0.50.1 - Fixed a bug in the favourite feature. - Added new device type "MUSICPLAYER"
- Removed predefined TUNER capabilities from MEDIAPLAYER. can still be added manually. Existing drivers will be untouched. - Removed predefined VOLUME capabilities from MEDIAPLAYER. can still be added manually. Existing drivers will be untouched. - removed depricated buttons 'SKIP BACKWARD' and 'SKIP FORWARD' for new virtual devices. - Included "specificname" SDK feature. 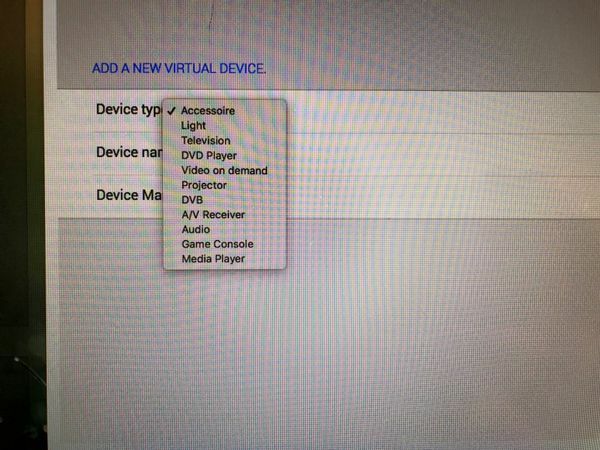 New virtual devices won't be added as MEDIA or GAME but with their specific name. Nice will wait for this update My own CLIMAat is at this moment to hot-). My brains are overheated. Hi Niels! Neeo looks awesome, I'm actually considering buying one . Just wondering, with you're Neeo setup, what's handles by Neeo and what's handled by Homey? For example, in terms of flows. Or the kodi integration you showed us.. The kodi integration will be a totally separated driver for NEEO. Offering a way to browse through your library directly on the remote or app. the neeo - Homey integration lets you control every aspect of the remote. Commanding every button, switch, slider and recipe you have on NEEO. Besides that you can build your own virtual devices using the homey UI, this way you can use the NEEO remote to control every device connected to your homey including your homey itself. A good example; If you use a homey AVR app for instance, you can create a AVR virtual device in the NEEO app that include a slider. With flows you can link the slider to the AVR volume. This way you can slide the volume using your neeo remote. Another flow can update the slider state when for instance you use the volume knob on the AVR. For that you’ll use the AVR app “volume changed” card (or equivalent) and add a NEEO card to update the state of the slider. the virtual devices offer buttons, switches, sliders, images, text fields you can all use in flows. All events generated by a NEEO remote are sent to homey. So homey knows exactly what recipe is active and when buttons are pressed etcetra. So all in all everything I could think off i have exposed to the users. But how do you catch events from Kodi by the way (e.g. when a movie starts)? Does the NEEO remote send an event to Homey? Or does Homey track kodi events (with the Kodi app for example)? The way I see it is that Homey should listen to events of devices, regardless of whether they were controlled by NEEO. NEEO should be a controller only (e.g. do this or turn this light on). Maybe I should rephrase my question. Do NEEO recipes replace Homey flows? Or are NEEO recipes just a 'chain' of commands? (turn tv on, turn playstation on, switch tv to HDMI1). I would purchase NEEO if it is a really advanced controller, rather than a partial replacement of homey. It’s not a replacement. It’s the best combination of HA solutions you could possibly have. NEEO and Homey strengthening each other not replacing one or the other. Sweet. Then it's on my wish list :-). One remote to rule them all!